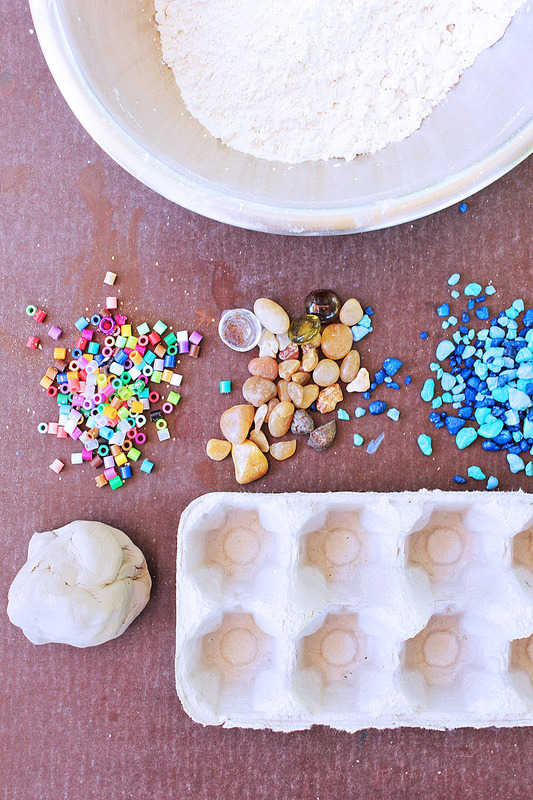 I’ve been playing around with plaster of Paris projects behind the scenes during Clay Month, trying to come up with a fun and engaging project you’ll be inspired to try with your kids. I’ve had a lot of fun but quite of few of the projects I made were, well, kind of ugly. There I said it! They were great to work on but not so purddy to look at. And so I kept plugging away until I came up with this little diddy, which I love because it’s always interesting casting objects in plaster AND I love mosaics. 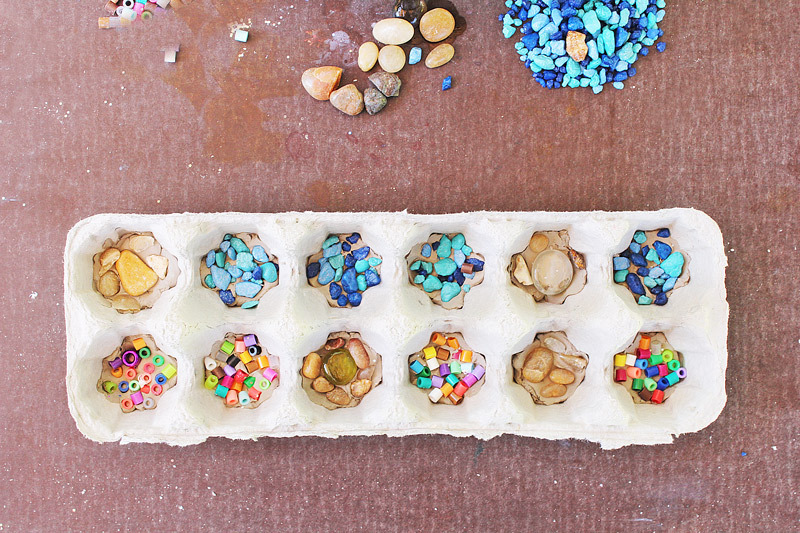 Better yet, using egg cartons to make these is a great way to reuse packaging when making art. Score! Mosaic Treasure Tiles would be a really sweet project for a class/campers to commemorate a field trip or other outdoor adventure. Collect some tiny treasures along the way, cast them in plaster, and viola, you have a lovely little collection of special objects. This post contains affiliate links to products I love and recommend to my readers, plus it keeps this little blog o’mine afloat! Thank you! Small Treasures: shells, rocks, beads, etc. 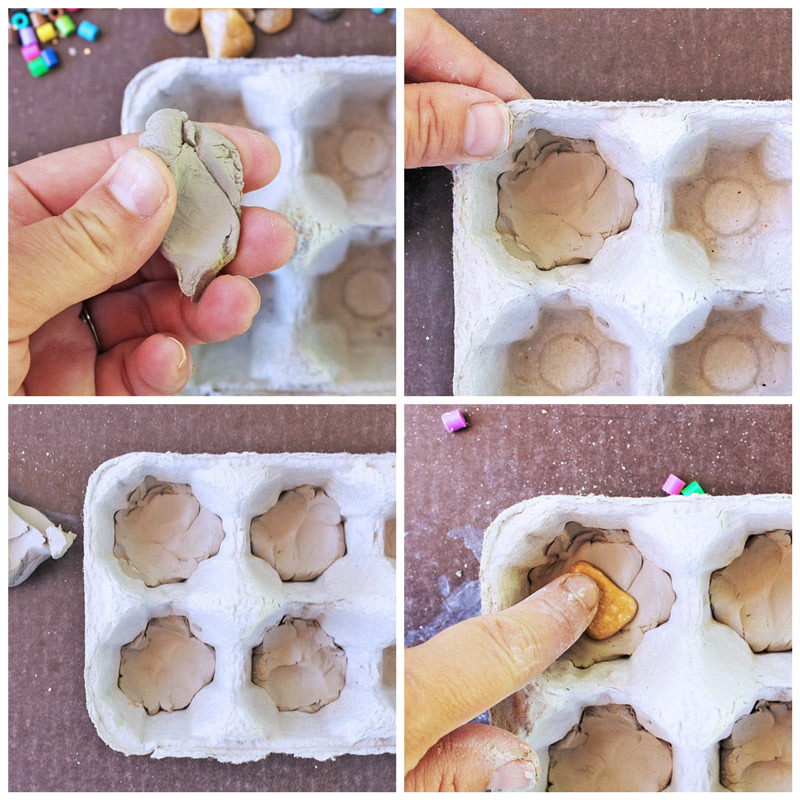 Step One Break off small chunks of clay and press them into the bottom of each individual section of the egg carton. Smooth the clay out as much as possible and press into the edges. You want the cups to be about 1/3 full. Step Two Place your treasures into the clay. If you want a certain side showing in the final tile be sure to press it into the clay upside down. Press all the objects firmly into the clay. Step Three Measure out your plaster of Paris and water using a 2:1 ratio of plaster to water or according to the directions on the packaging. Step Four Mix that plaster! You want the mixture to be like pancake batter, thick but pourable. If it looks like whipped cream add a little more water. The plaster will begin to set within minutes so work quickly to mix it! Step Five Add a spoonful or two of plaster to each cup in the egg carton. Be sure to fill them just enough to cover the treasures. You don’t want the plaster to overflow into the adjacent cups. Time permitting, smooth out the plaster with a spoon if it’s lumpy. Step Six Let dry. The plaster will fully cure within 24 hours but you can remove it from the egg carton as early as 30 minutes after pouring. Step Seven To remove the tiles, break off the egg carton cups and peel away the cardboard. Carefully remove the clay from the top of the tiles. Clean your tiles by dipping them in water and using a toothbrush to clean off any excess clay and cardboard. Some small objects may stick to the clay. That’s okay, the imprints are fun to look at. Use a large disposable bowl and spoon for mixing plaster. Plaster will stick to the sides of your bowl if not cleaned immediately after mixing. Don’t skip the clay! If you fill the egg cartons without putting clay on the bottom the plaster of Paris will engulf the treasures and cover them completely. Trust me, it happened to ours. 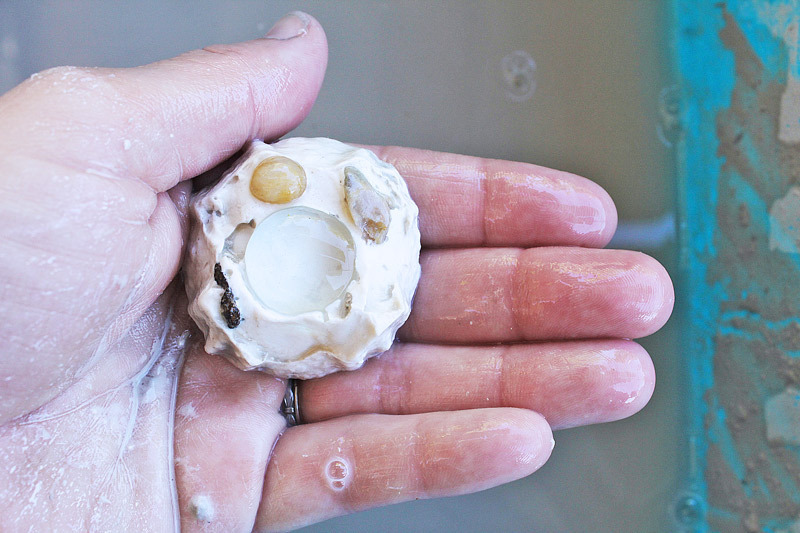 Plaster of Paris heats up as it dries so keep children away from it during the drying process. The dust is also an irritant, so use caution when mixing. I let my daughter put the plaster in each egg cup and then we quickly washed her hands thoroughly. If you want to get fancy you can sand down rough edges of the finished tiles with sandpaper. Be sure to wear a dust mask! Smooth objects are harder to embed in the plaster. If they pop out after casting, simply add a little glue and pop them back in place. Have fun with the objects! We cast a Lego mini fig just for kicks! Friedensreich Hundertwasser. That’s a mouthful huh? Hundertwasser was an Austrian artist whose colorful work bled into architecture. He is well known for his flowing, non-linear buildings which he often embellished with tiles and other embedded objects. As a college student I had the chance to visit the Kunst Haus Wien in Vienna and I’ll never forget the undulating tiled floor. 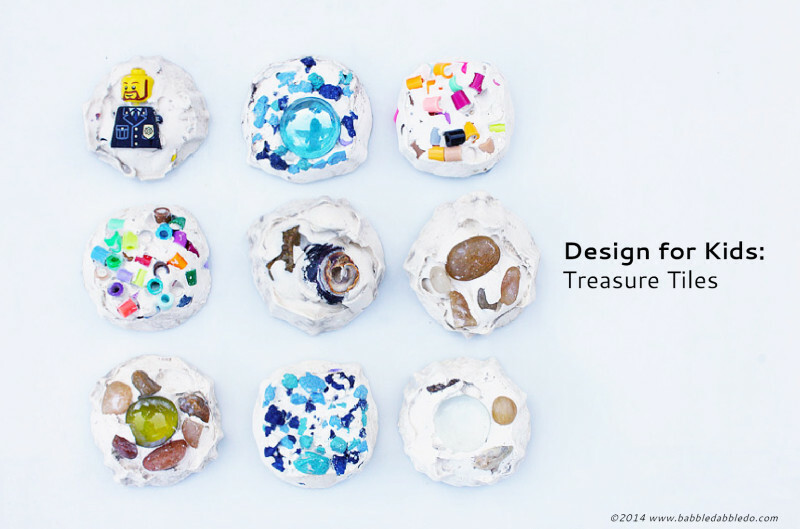 I really love the idea of capturing meaningful objects and images into physical space and our treasure tiles are made with this idea in mind. 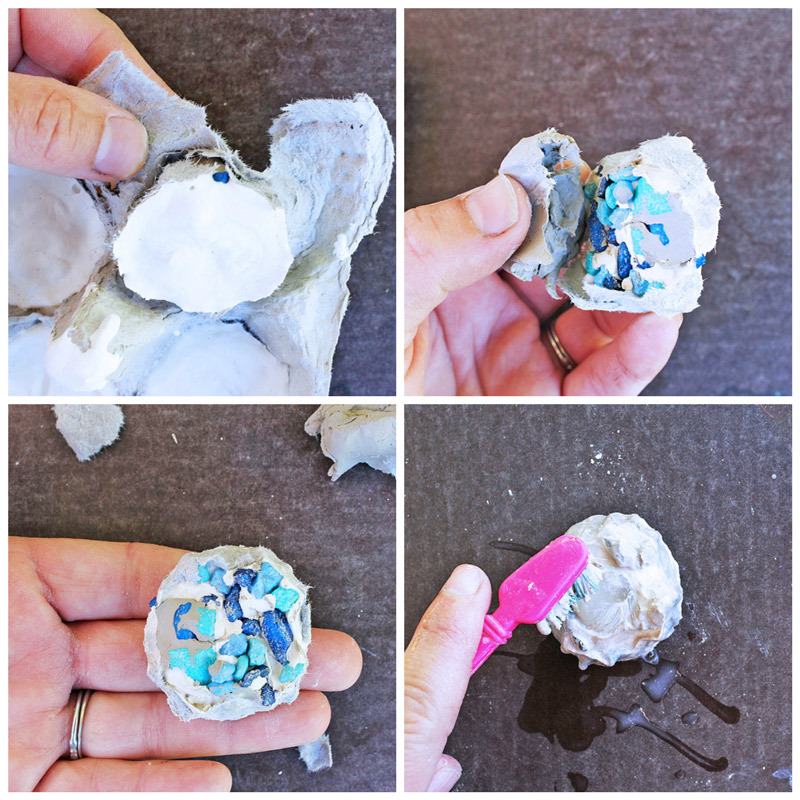 I love plaster of Paris projects for kids because of the surprise factor when removing plaster from a mold. It never fails to impress when you pull an object out of a mold to see how it turned out. 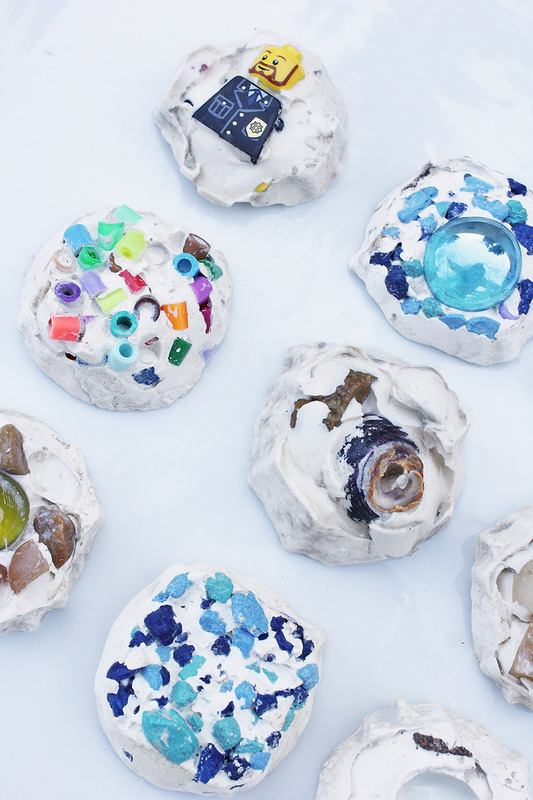 Using larger containers like hummus or salsa containers would be a fun way to collage a variety of special objects into a larger tile and a great earth day activity! For more fun with found nature objects you can read about making a natural loom. If you liked working with plaster check out this great post on How to Make African Masks by Artchoo. That project make me want to buy some of these funky face molds: Face Forms. Wouldn’t that be a fun class art project for kids? And don’t miss out on more design here on Babble Dabble Do! Your child’s inner Friedensreich Hundertwasser thanks you! Subscribe below or like us on FB. Thanks Meri, super fun too! Thanks Bar!!! Since I LOVE your blog this compliment has made my day! These are just Beautoful! I am finally getting around to giving these a shot with my five year old and I! Found a bin of crystals from Thrift Store for $3. Split them between letter rocks w sharpies and adding the small ones to this project! Thank you for the inspiration and ideas! Oooooo Adding crystals sounds awesome! Post a pic on our FB page when your’e finished!